six more times, you should have eight rows worked in all. Turn. in all. Turn, make 11ch. row three more times. Turn. Row 22 - 3ch, 3tr into first 2ch space, 4tr into each 2ch space to end, ss to top of 3ch. 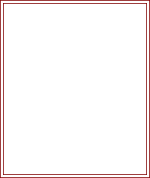 Row 24 - 3ch, 3tr into first 2ch space, 4tr into each 2ch space to end, ss to top of 3ch. beginning of row. Turn. (79tr + 3ch) Rpt last row four more times. Turn. Next Row - 3ch, tr into each tr to end, 1tr into top of 3ch. Turn. Rpt last row once. Turn. from * to * to end, 1tr into top of 3ch. Turn. Rpt last row three more times. Fasten off. yarn, attach 4 medium sized buttons evenly along tr's on bottom of hot water bottle cover, fold up flap and use gaps in tr's as buttonholes. Decorate with a ribbon bow and rosebud. 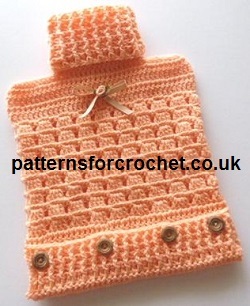 Hope you enjoy this free crochet pattern for Hot Water Bottle Cover.